If you’re wanting a home cleaning service in Stockton on Tees, why should you consider Select House Cleaners? Well, there’s a number of reasons, so we’ve placed some of the most important on the list below. Now the list shown isn’t exhaustive, for instance, we never transport cleaners from outside the area either, as this adds to the expense (which will need to be passed onto the customer) some companies we know have cleaners who live more than 30 + miles away from a customer, this is not only costly, but it’s also tiring for the cleaner as the work can be labour intensive. Your Select House Cleaner in Stockton on Tees will also use your cleaning materials to ensure you’re not having to pay additional expenses because extra cleaning materials are being supplied, after all, we don’t see the sense (and we’re sure you don’t either) in charging a someone extra for providing glass cleaner, dusters, polish and a hoover etc., when 98% of our clients already have the required implements in their own home. If you’re interested in knowing more you can view our Frequently Asked Cleaning Questions page (you’ll find the link at the top of this page) or ring us on our FREEPHONE number at the top and bottom of this page (without any obligation whatsoever) we’d love to hear from you. 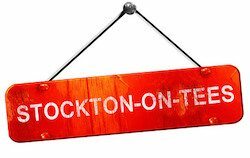 Stockton on Tees – Looking Back.